Earlier this month, the Charleston Daily Mail reported that assistant greyhound trainer James Grace had his state license revoked after a greyhound named Kiowa Dutch Girl suffered a broken leg and was denied veterinary care. The newspaper's story was based in part on information from GREY2K USA. We are grateful that the Daily Mail shed light on this case, and also that the West Virginia Racing Commission took action against Grace and another individual. However, this should not be the end of the story. After examining the full case file, it's clear that Grace should also be charged under the state law against cruelty to animals. "I know the dog owner, Kay Smith who owns a lot of dogs, and Bob Mackey the kennel owner, or the GPA wouldn't pay for the surgery ... I've been working with greyhounds for 35 years and I've seen many breaks over the years where dogs were not taken to the vet and they healed naturally and given away as pets." "The whole rear (right) leg was swollen, she couldn't even get out of the cage. I had to lift her up and carry her out to go to the bathroom, and when her leg touched the floor she cried, and she was constantly panting as if she was exhausted." West Virginia law states that it is illegal to intentionally withhold "medical treatment, necessary to sustain normal health and fitness or to end the suffering of any animal." In the coming weeks, we will encourage the proper authorities to investigate this case and take further action. 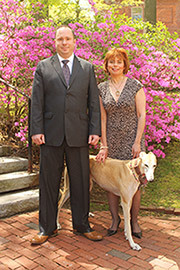 All individuals who willfully neglect greyhounds must be held accountable in a court of law. What a disgusting piece of trash - James Grace should be denied any access to animals for the rest of his life, fined & spend some quality time in a very small cell. There is NO need to make these already abused animals suffer even ONE TINY bit more! Very sad to say that I am not in the least surprised. Thank You, Carey and Christine, for so diligently working to give Greys the lives they deserve by stopping this industry. Although I agree that an animal should never be left to suffer, I want to play the devil's advocate for the Grace gentleman. I think what he meant was that if he had told the owners about the injuries, the dog would have been euthanized, not received the surgery it needed, because it is cheaper and in any case, that dog can't race anymore. So he thought it was better to let it suffer than to send it to its death. It's a rough decision. We would have fought for the dog's life and stolen it or paid for the surgery ourselves if it was us, granted, but I think our hate should not be directed towards him, but towards laws that allow animals to be put down just like that... Mind you PETA would say it would be better off dead. In the end, the dilema is more complicated that just the one guy. You know, since I have owned a greyhound, I have been wanting to see her run (she is lazy and never runs full speed cause she never needs to, other dogs are too slow, she just trots). I fight myself not to go see races because I know these dogs are mistreated, but they are so beautiful when they run (I never went, I am sure I would be horrified if I did, It probably doesn't look at all like it looks in my head). I wish that dog racing was just normal people who love their dog and want to train them to do something fun and then you go and have races with other dogs. Like weiner dogs races you know? They have them all the time and they aren't about money, they are about how hilarious these little sausages run and how fast they can actually be. People racing dachshund aren't evil rich people, they are owners with their kids and their pet. They have competition for frisbee and for all kinds of things with dogs. Why can't they race greyhounds the same way? I think the gambling is the problem, not the race. When you insert the potential for money making, you insert the potential for abuse. We had a Greyhound that we lost to bone cancer a few years ago. We have an acre of land but have fenced in only a part for our dogs. 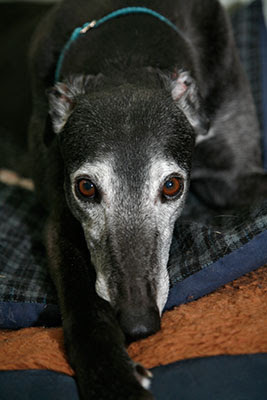 Tangy, our Grey would do what we called her "circles" but couldn't run any distance in it. As soon as they opened the Dog Park, a fenced, off lead area which is two acres in size, we took her. She tore up and down for a good while and every time she passed us she had a grin on her face. If you can find a similar park near you, take your dog there. While the other dogs might not be as fast as she is, if the park is any size, there will always be one "ahead" of her for her to run past. Well, you can play devil's advocate all you want, but cruelty is cruelty is cruelty, and there is no defense or "other side" to denying this fine dog any medical treatment and letting her suffer. I vote for breaking Mr. Grace's leg and forcing him to lay around for a few days - and, that's not in the least a "rough decision", it's an incredibly easy decision. Also it's not directing hate towards Mr. Grace, it's justice. We don't need to "direct hate toward laws", we just need to work to change the laws. What Will Greyhound Race Promoters Say Next?